Until the coming of the railroad in mid-19th century, travel on land was difficult and very slow. For the most part travel was done on foot, as few were able to afford horses or oxen to pull their wagons. In the Mediterranean world there were the Roman roads but as the centuries went on, many of these were not kept up. People who traveled usually did so in groups for protection. The distance between the inns on the road was from 20 to 25 miles, and the travelers had to reach the safety of the villages before nightfall. If they did not arrive by nightfall, their goods could be stolen by the local bands of thieves. As there was no long distant communication, the travelers never knew if the inn they were walking to had enough food. When they arrived they were served what was available, and went hungry if there was famine in the area. Everyone slept in the same large room in the inn, and any coins or valuables the travelers carried had to be kept hidden. In this context we can understand how important it was for travelers to have a saint to whom they could petition for protection. 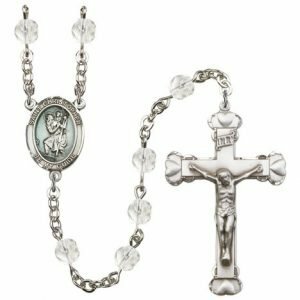 Their prayers of petition went most often to St. Christopher. 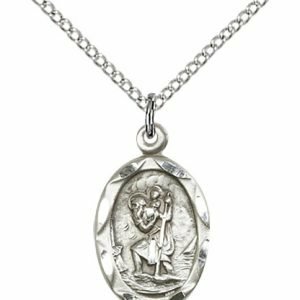 There are many stories about St. Christopher who lived in the Eastern Mediterranean world. He is said to have been a large and strong man, looking for the most powerful person to serve. For a while he thought he had found that in Satan leading him to the life of a thief. He spent some time with a band of robbers preying on travelers. When he saw one of the thieves making the Sign of the Cross, Christopher discovered that the man feared Jesus more than Satan. Christopher left the gang to serve this more powerful Lord Jesus. St. Christopher was eventually martyred by a pagan king. But the memory of his service to others in their travels was kept alive. 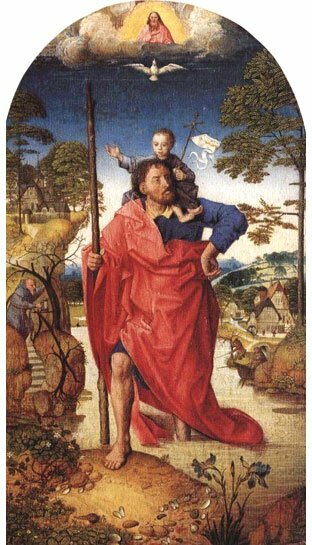 The image of St. Christopher carrying the Christ Child is his most popular image in holy cards, stained glass windows, and statues of every size. 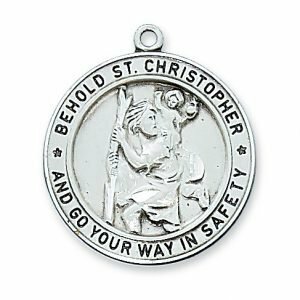 St. Christopher is one of the most popular of saints, and his intercession is petitioned by travelers, soldiers, sailors, those caught in storms, and transportation workers. He no longer has a universally celebrated feast day in the Roman Calendar, but is remembered by many local churches. 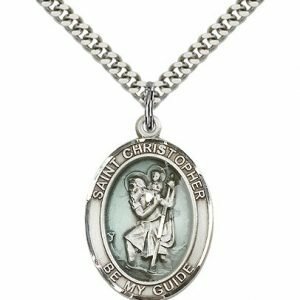 St. Christopher is perhaps one of the most well-known of the saints, and although he no longer holds a feast day on the Roman calendar, he is highly honored and regarded by Catholics worldwide. 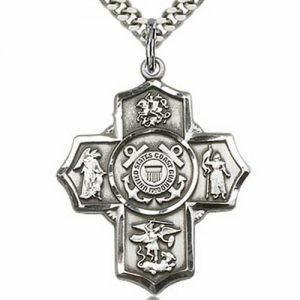 Many people wear St. Christopher medals to seek his guidance during travel (including the daily travel through life). Others clip St. Christopher visor clips to their car visors in order to pray for his assistance in their travels along the roadways. 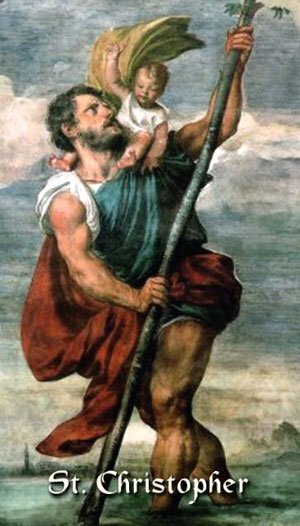 St. Christopher is usually depicted as a tall man with a beard carrying a child on his shoulder across a waterway. He is one of the fourteen holy helpers – saints who have been grouped by the Catholic Church as those whose intercession has been known to be particularly helpful and effective. 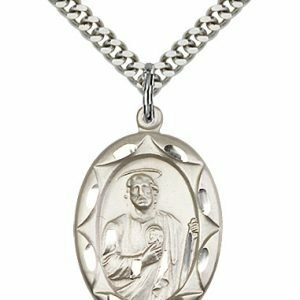 Most famously he is regarded as the patron saint of travelers. His protection is sought for drivers, pilots, boaters, and transportation workers. When considering that he lived in the 4th century, this patronage may seem like an odd pairing. So how did it happen? 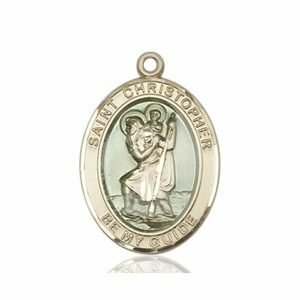 St. Christopher was not always called by this name. Born in the 300s, some say his original name was Reprobus, whereas others believe his name may have been Offerus. He is described as being about seven and a half feet tall, with a “fearsome face.” He was determined to serve the greatest king of all, and began working for the king of Canaan, which was his homeland. While serving the king, he noticed that when someone would mention the name of the devil, the king would make the sign of the cross. Reprobus thought that if the king was afraid of the devil, that must mean the devil was greater. So, he decided to serve the devil. One day he came across a pack of robbers traveling on the road, one of which claimed to be the devil himself. Reprobus watched as the devil refused to walk on the side of the road that had a cross stuck in the ground. This led him to believe that Christ was greater than the devil. He went in search of Christ, wanting to serve him as the greatest king of all. While looking for Christ, he met a hermit who baptized him and taught him about Christ. His ministry as a Christian was to help people across a very dangerous river, where many people died in their attempt to reach the other side. Due to Christopher’s size, crossing the river was much less of a challenge for him, and he was able to safely see travelers across the raging river. After this had occurred, Christopher went to the towns of Lycia and Antioch to comfort the Christians who were being martyred for their faith. The king attempted to get Christopher to worship the pagan gods, but Christopher refused. His steadfast faith converted many in the city. The king ordered that Christopher should be martyred, and after many attempts at his life, he was beheaded. 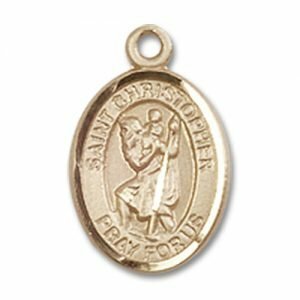 St. Christopher had become a soldier for the faith, firm in his conviction to the very end. 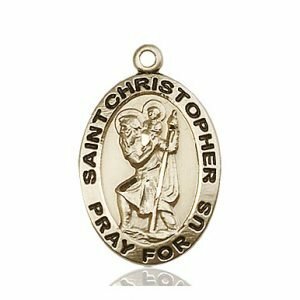 The historical facts of St. Christopher have been lost over time. 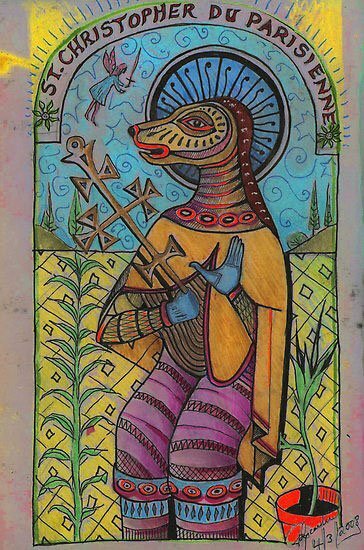 This means that what is known of him is what has been preserved by writers who documented the stories they heard years after St. Christopher lived. The best known of these accounts is found in “The Golden Legend,” written in the 13th century by Jacob de Voragine. 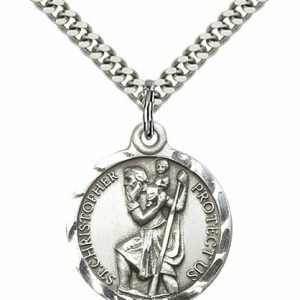 It is due to this lack of historical fact that St. Christopher’s feast day, July 25th, is no longer honored in the Roman calendar. 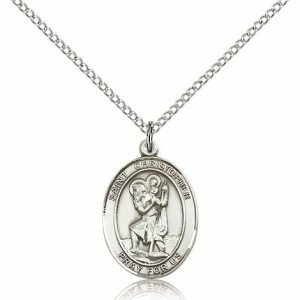 This caused some confusion among Catholics when it happened in 1969, and many though that this meant St. Christopher was no longer considered a saint. This is untrue. 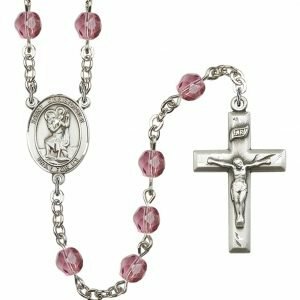 He is still recognized as a saint, and is still revered as a powerful helper in times of need. Athletes, mariners, travelers, against lightning, bachelors, boatmen, soldiers, floods, a holy death, drivers, sailors, transportation workers. Another version of this is that prior to his baptism, St. Christopher had a rough appearance which may have been frightening to some. After his baptism, it is said that his face took on a more gentle, human appearance. 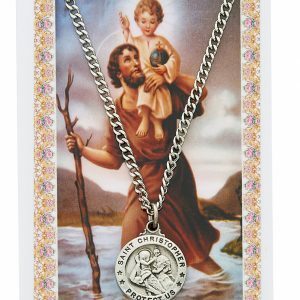 Most depictions of Saint Christopher whether they are on a necklace, religious medal or a rosary center show him with a haloed child on his shoulder and a staff in his hand. 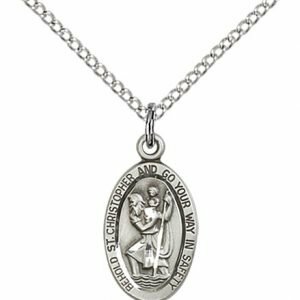 This relates to the legend of Christopher carry the child Jesus and the weight of the world’s sins across a dangerous river. 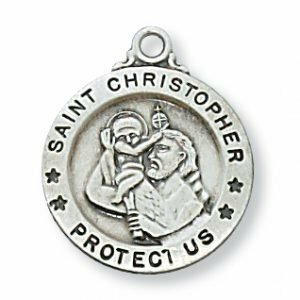 Let Saint Christopher be your partner in prayer as you say one of the prayers below or as part of your rosary devotion. 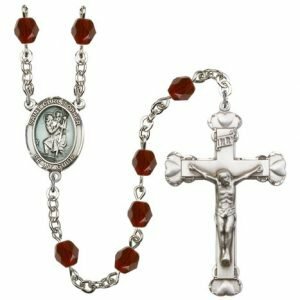 Find Saint Christopher Rosary Beads here. Grant me O Lord a steady hand and a watchful eye, that no one shall be hurt as I pass by. 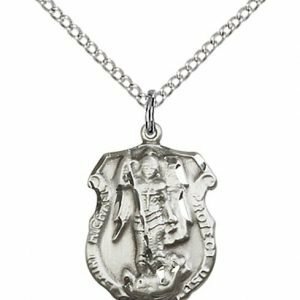 Thou gavest life, I pray no act of mine may take away or mar that gift of Thine. Shelter those, dear Lord, who bear me company, from the evils of fire and all calamity. Teach me to use my car for others’ need; nor miss through love of undue speed the beauty of the world; that thus I may with joy and courtesy go on my way. 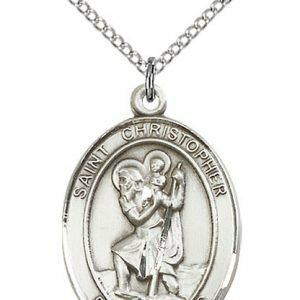 St. Christopher, holy patron of travelers, protect me and lead me safely to my destiny. 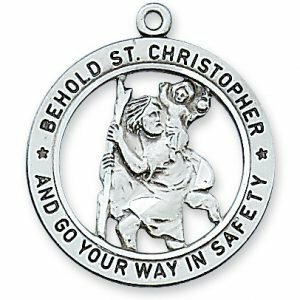 Dear St. Christopher, you have inherited a beautiful name – Christ-bearer – as a result of a wonderful legend that while carrying people across a raging stream you also carried the Child Jesus. Teach us to be true Christbearers to those who do not know him. Protect all drivers who often transport those who bear Christ within them. Amen. O Lord, we humbly ask you to give Your Almighty protection to all travelers. Accept our fervent and sincere prayers that through Your great power and unfaltering spirit, those who travel may reach their destination safe and sound. Grant Your divine guidance and infinite wisdom to all who operate automobiles, trains, planes and boats. Inspire them with due sense of duty and knowledge and help them guide those entrusted in their care to complete their travel safely.